After going close to a stage win with his runner-up slot yesterday, Andre Greipel got things exactly right today when he powered in first at the end of day five of the Tour of Qatar. The German Lotto Belisol rider jumped hard from third place in the lined-out bunch, catching rival Aidis Kruopis by surprise and opening a gap the Orica GreenEdge rider was unable to close. The other sprinters had no answer to Greipel’s surge, with Theo Bos (Belkin) having to be satisfied with third and Daniele Bennati (Tinkoff Saxo), Matteo Pelucchi (IAM Cycling) and Jurgen Roelandts (Lotto Belisol) taking the minor placings. Niki Terpstra and Tom Boonen (both Omega Pharma Quick Step) both finished in the top ten but were outside the time bonuses. Terpstra continues to lead overall, maintaining his seventeen second lead over Boonen and making it virtually certain that he will win the race tomorrow. Jurgen Roelandts (Lotto Belisol) remains third but his twenty second deficit is similarly very difficult to overcome. 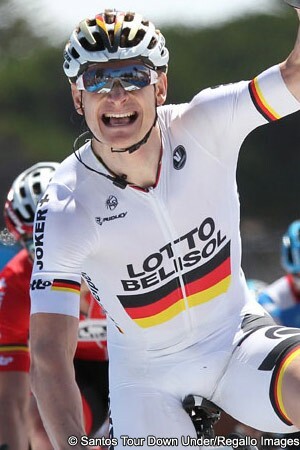 Greipel’s success was his third win of the year, following on from two stages in the Santos Tour Down Under. He credited the Lotto Belisol riders for their work. “The team did a great job. There were no echelons today. Starting from 60 km before the end Lars Bak and Gert Dockx were pulling to get the breakaway back and put the rest of us out of the wind all day. We didn't get any help,” he said. Bos said that he hasn’t felt good in recent days but that things started to click better today. “I’m still not one hundred per cent, but my legs were OK today,” he stated. Six kilometres in, Stijn Devolver (Trek Factory Racing), Vladimir Isaychev (Katusha), Daniel Schorn (NetApp Endura) and Patrick Gretsch (Ag2r La Mondiale) attacked and opened a clear lead on the bunch. Schorn beat Isaychev and Gretsch to take the first intermediate sprint at Umm Thenaitain farm (km 44). At that point they were two minutes twenty seconds ahead of lone chaser Rafaa Chtioui (Skydive Dubai) and five minutes clear ahead of the bunch. By the fifty kilometre point, Chtioui had given up on his bid and the peloton was a further thirty seconds behind. The break continued to drive hard and reached a maximum advantage of six minutes 50 seconds by kilometre 59. From there things started to swing the other way, with an increase in speed plus stronger winds starting to turn things around. The break’s advantage was down to four minutes at the second intermediate sprint, that of Madinat Al Shamal (km 95.5). Gretsch led the riders over the first passage of the finish line there, with Isaychev again second and Devolder third. The riders then faced a large lap of a 36.5 kilometre circuit plus two smaller ones of 13.5 kilometres each. The riders in the move continued to push hard but their advantage ebbed to one minute 25 seconds before rising again two and a half minutes with just over 25 kilometres to go. However any thoughts of them being able to stay away were dashed when the peloton ramped up the speed; with sixteen kilometres to go they were one minute ten seconds ahead and six kilometres later, the difference between break and bunch was a mere ten seconds. The junction was finally made two kilometres later, making a bunch sprint practically guaranteed. Heading into the final kilometres, the NetApp Endura team hit the front to try to set things up for their Irish neo-pro Sam Bennett, who was fifth yesterday. They lined things out while behind the other sprinters’ teams sat in wait. Katusha’s Alexander Kristoff had to use energy he had hoped to keep for the sprint after he punctured and needed to chase back on, with this setback damaging his chances of fighting for the stage win. Orica GreenEdge took over in the pacesetting, aiming to help their sprinter Aidis Kruopis. The Omega Pharma Quick Step riders were close by and looking for the right moment to surge, while NetApp Endura was battling to get back to the head of affairs again. Lotto Belisol lead out the sprint, then Greipel lunged forward from third place, coming off Kruopis’ wheel and opening a gap of two bike lengths. The Orica GreenEdge rider tried desperately to get back to him but was unable to do so, having to settle for second. Theo Bos (Belkin) came through for third, with Daniele Bennati (Tinkoff Saxo), Matteo Pelucchi (IAM Cycling), Jurgen Roelandts (Lotto Belisol) and Sam Bennett (NetApp Endura) next over the line. The Tour of Qatar concludes tomorrow with a 113.5 kilometre race from Sealine Beach Resort to Doha Corniche.